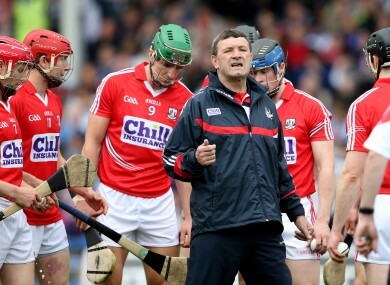 Jimmy Barry-Murphy has rung the changes for Cork match. AIDAN RYAN IS a surprise inclusion at full-back for the Cork senior hurlers for next Sunday’s Allianz hurling league final. Midleton club man Ryan has not featured for Cork in this year’s league to date but has been handed the number three jersey for the clash with Waterford in Semple Stadium. Ryan started in last Saturday’s senior challenge against Kilkenny and has now been named in the starting side to face the Deise. He last started a league game for Cork in 2010 against Dublin and came on as a sub in the same campaign against Limerick. Back in 2009 Ryan started Cork’s opening two league games against Tipperary and Dublin at a time when the county was without several first-choice players due to a conflict with then manager Gerald McCarthy. Previously Ryan had been part of the Cork U21 team in 2007 that lost out in the All-Ireland semi-final against Galway after extra-time. He spent some time in Australia in 2012 and 2013 before returning to line out in the half-forward line on the Midleton team that ended a 22-year wait for a Cork senior hurling crown in 2013. Ryan’s inclusion is one of three changes to the team that saw off Dublin at the semi-final stage with Mark Ellis and Cormac Murphy also back from injury to start in the half-back line. There are several positional changes with Damien Cahalane, William Kearney and Luke O’Farrell the three players to make way. Waterford, meanwhile, have stuck with the same side that defeated Tipperary in the semi-final. Derek McGrath reported a clean bit of health after training on Friday and opted to stick with the players who got the Déise to their first league final since 2007. Email “Cork place faith in rookie full-back for league decider while Waterford are unchanged”. Feedback on “Cork place faith in rookie full-back for league decider while Waterford are unchanged”.